First and very important is to dress to keep warm even on a mild night. The cold can soon begin to spoil the evening if it is not kept out from the start. Avoid lights that shine directly on to the observing position especially from the south. If there are unavoidable lights then set up a screen using canes and sheets or towels to prevent the light shining directly into the observer’s eyes. It is useful to make an observing plan before starting to observe. Notes of what is intended to be observed can be in the form of written notes or as a chart with notes. This avoids trying to think about what to look at next. This will not be necessary if it is planned to observe the Moon or one of the planets. It is well worth getting a planetarium application for your computer to check out what is available to look at from night to night. Now it is time to think about setting the telescope up ready for observing. In the previous article (Setting up your new telescope) it was suggested that the telescope is set up about 30 minutes before starting serious observing. This means it should be put outside at least, even if not set up correctly at that time. It takes this time for the telescope to cool down to the ambient temperature outside. Differential temperatures can cause degradation of the image and the telescope will not perform as well as when it has acclimatised. Detailed setting up procedure was discussed in the previous article (Setting up your new telescope) so it is assumed that this has already been done. However some setting up is required every time before starting to observe. The two basic setting up operations are aligning and levelling the telescope assembly. If simple optical observing is to be carried out, approximate levelling and alignment will be good enough. If astro-imaging is to be attempted more accuracy will be required and this will be covered in later articles. First we must check the alignment of the finder. Fit a low power eyepiece (20mm or 25mm) into the focuser unit. Locate a bright star or planet and aim the telescope at this object. If the finder has already been aligned on a distant object during the day then used the finder to locate the bright object. If the finder has not been roughly aligned look along the telescope tube, release the clutches and roughly align the telescope on the object. Gently move the telescope around while looking through the eyepiece until the object appears. Lock the telescope clutches. Use the slow motion drives to centralise the object in the eyepiece. Look through the finder and use the adjusting screws to centralise the object. Re-centralise the object in the main telescope and adjust to centralise in the finder again. When alignment is complete the finder is ready to use. Alignment can be carried out using a magnetic compass or position the telescope so that the Right Ascension (RA) axis of the mounting is pointing approximately towards the Pole Star – Polaris (See the What's Up section on this site find the location of Polaris). Levelling can be achieved using a bubble level gauge placed on the tripod leg spreader or other flat surface on the assembly. Raise the tripod legs to the required height. Place the bubble level gauge in position in a north / south alignment. Adjust the height of the legs until the bubble is centralised. Reposition the bubble level gauge east / west and adjust the legs. Repeat until level is achieved. For very approximate alignment (if no drive motors are fitted) a compass can be used to check the polar alignment. Loosen the hand-nut that secures the mounting to the tripod. Rotate the mounting until the RA axis is aligned with the north point of the compass needle. Re-tighten the hand-nut that secures the mounting to the tripod. Any misalignment can be compensated for using the drive knobs when tracking an object as it appears to move across the field of view. 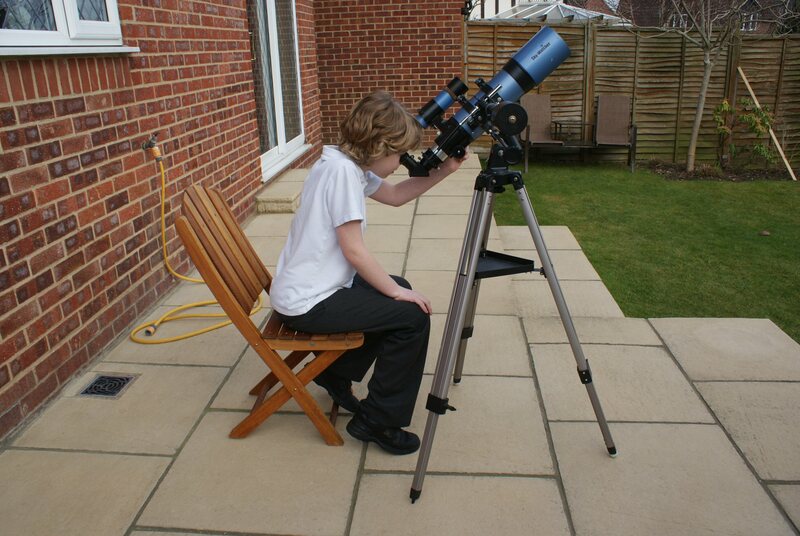 Finer alignment can be achieved by carefully aligning the telescope on Polaris. The mount must first be levelled. Check that the RA angle adjustor is correctly aligned on 51.5°. With the telescope tube pointing south (align with the compass) lower the telescope tube until it looks level with the ground. 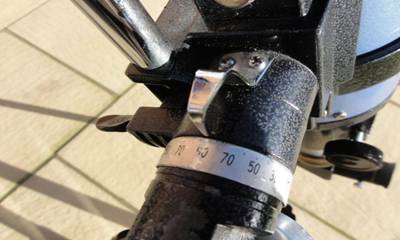 Position a bubble level gauge on top of the tube (it can be secured using elastic bands, Velcro or adhesive tape). 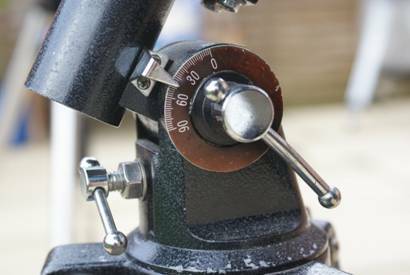 Adjust the telescope tube until it is horizontal as shown by the bubble being central in the gauge and lock the Dec. Check the Declination (Dec) dial and confirm that 38.5° is aligned with the indicator pointer. Release the Dec lock and raise the telescope tube until 90° is indicated on the dial. Look through the finder (which is now rather inconveniently up-side-down) and Polaris should be positioned in the view of the finder. NOTE The setting angle of 38.5° is the latitude setting for Newbury UK (51.4° rounded t0 51.5°) subtracted from 90° to give the angle between our horizon and Celestial Equator. This angle is actually -38.6° below the celestial Equator and where our telescope tube should be horizontal. 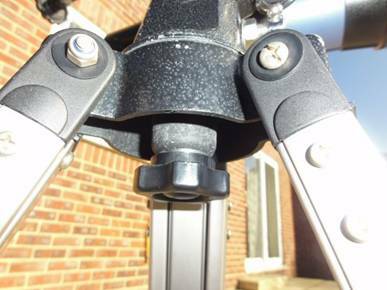 Centralise Polaris in the finder as follows: Loosen the hand-nut that secures the mounting to the tripod (see the picture below). 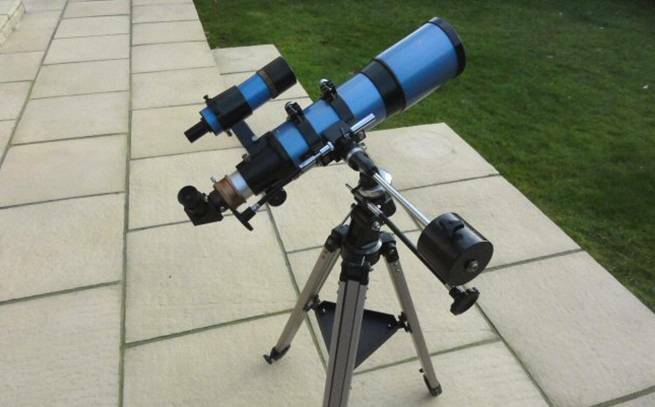 Rotate the mounting until the Polaris is centralised east / west. Re-tighten the hand-nut that secures the mounting to the tripod. Support the Diagonal (the 90° mirror assembly on the focuser) and loosen the securing screws. Rotate the diagonal through 180° and tighten the securing screws (See the second image above). This will allow the focuser to be accessed and fit a low power eyepiece (20mm or 25mm) into the focuser. Polaris should be in the field of view. Finer alignment adjustment can be made by centralising Polaris in the field of view of the eyepiece by repeating the adjustments outlined using the finder but this should not be necessary for optical observing. Return the telescope tube to face south and remove the bubble levelling gauge. For the first observing session it is a good idea to start with Moon if it is around. It is large and bright and is therefore easy to find. The Moon may well be out of focus and may even be so far out of focus that appears as just a bright light. Rotate the focuser knob in one direction and then the other until the Moon appears clearer. Look at it for a few seconds then make small adjustments to the focus until it is perfectly clear. It will be necessary to adjust the RA drive every few minutes to bring the Moon back into the field of view. It will move quite quickly across the field of view due to the rotation of Earth on its axis. The Moon is very bright especially if it is between half and full. 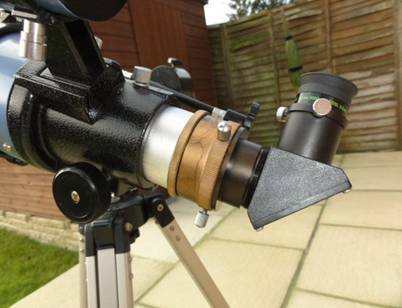 To lessen the glare it is possible to cut down the amount of light entering some telescopes by fitting the dust cover and removing the small cap to allow a less light to enter the telescope. Once the focuser adjustment has been completed have a good look at the Moon and the many features it has on view. Look especially near the ‘Terminator’ the dividing line between the light (daytime) side and the dark (night) side. Here the shadows are long and pronounced because it is sunset or sunrise. This makes features like craters and mountains stand out with greater relief and look almost three dimensional. Use the RA and Dec knobs to move the image around the field of view to get used to the way the telescope is moved. Move the Moon out of view then use the finder to re-centralise it. When a little experience has been gained in moving the telescope around it is time to ‘up’ the magnification. Using the RA drive move the Moon back across the field of view so it can drift across the full field of view. Carefully release and remove the low power eyepiece and fit a higher power (10mm). Look into the eyepiece and re-focus if necessary. The objects in the field of view will now appear twice as large and more detail can be seen. The disadvantages are: the Moon will appear to wobble more and it will move twice as fast across the field of view. We can’t do anything about the wobble due to the movement of air in our atmosphere but we can help. To lessen the wobble of the telescope use this technique to track the feature as it moves across the field of view. Move the feature as far as possible to the side where it starts the drift and let it drift right across without touching the telescope until it reaches the other side. This stops much of the wobble created by the observer. Another hint here is: put the eyepiece that is not being used in your pocket, preferably a trouser pocket to keep it warm. This helps to stop condensation forming on the lens when you next use it. The next objects to look out for are the planets. Jupiter, Venus, Mars and Saturn are the easiest to find and the most spectacular. They are also perfect for aligning the finder. Jupiter is the best for detail, it is large (for a planet) and colours can be seen in the cloud belts. The four bright moons can be seen to move noticeably during one observing session. Saturn is impressive because of its magnificent ring system. The rings will be visible using a 90mm telescope and possibly a 70mm telescope with a focal length longer than 700mm. Venus is very bright and easy to find but the view of the surface of this white cloud covered planet is bland. To make up for this Venus does show phases much like our Moon. When it first appears in the evening sky it is difficult to observe because it is close to the Sun and close to the western horizon. At this time the planet is on the other side of the Sun to us and therefore appears small but displays a nearly full disc. Venus gradually moves further out from the Sun and begins to catch up with Earth. The size of Venus appears to grow as it gets closer but its phase narrows. Eventually it moves back towards the Sun as it begins its pass between Earth and the Sun to reappear as a morning object. At this time it is at its largest apparent diameter and its narrowest crescent phase. As a morning object it then becomes smaller and the crescent shape widens until it appears almost full as it moves back around the far side of the Sun. Mars is quite small compared to Venus and Jupiter and appears about the same size as Saturn. It can appear quite a lot larger when Earth and Mars are at their closest approach. They were last at the closest point in their orbits in 2003 but will not be at their closest again until about 2019. The outer planets Uranus and Neptune are quite difficult to find but it is possible to see Uranus in a 100mm telescope and Neptune in a 120mm. However they appear as rather fuzzy blue stars. The technique used to find planets is similar to finding the Moon. 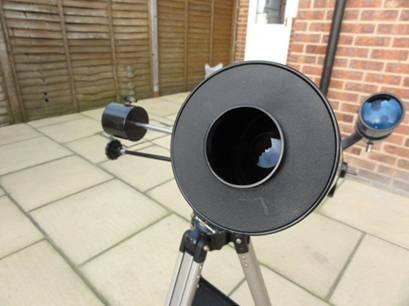 Use the finder and a 20mm to 25mm eyepiece to initially find the planet. 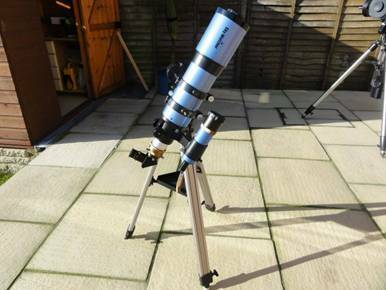 Then change to a 10mm or less eyepiece to see more detail. If supplied remove the 10mm eyepiece and fit a Barlow into the focuser. Insert the 10mm eyepiece into the Barlow and re-focus. This effectively doubles the eyepiece magnification.